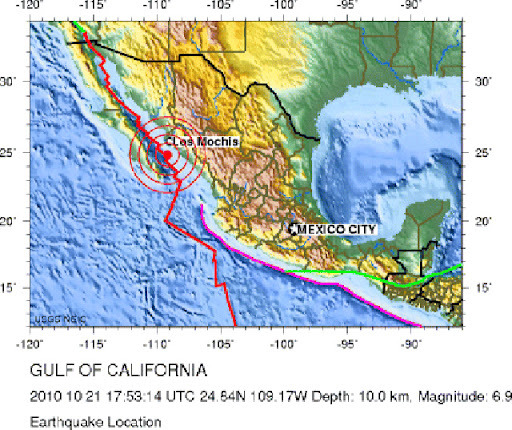 Magnitude 6.9 Thursday, October 21, 2010 at 11:53:14 AM 140 km (85 miles) NE of La Paz, Baja California Sur, Mexico. Editor self feel the quake in La Paz. Rolling sensation with pictures, lamps, computer monitors etc. moving and swinging. Neighbors walk also out of house confirming each-other the sensation. No damage etc. observed at all. Location La Paz / Fidepaz near Baja Sur government state-tourism building. Quake is reported as 140 km of coast. No tsunami warnings issued. Tsunami bulletin number 001 pacific tsunami warning center/noaa/nws issued at 1802z 21 oct 2010. This bulletin applies to areas within and bordering the pacific ocean and adjacent seas except Alaska, British Columbia., Washington, Oregon and California. evaluation: no destructive widespread tsunami threat exists based on historical earthquake and tsunami data. however - earthquakes of this size sometimes generate local tsunamis that can be destructive along coasts located within a hundred kilometers of the earthquake epicenter. authorities in the region of the epicenter should be aware of this possibility and take appropriate action.